Spanish: quinua, from Quechua: kinwa, is a grain-like crop grown primarily for its edible seeds. It is a pseudocereal rather than a true cereal, or grain, as it is not a member of the grass family. As a chenopod, quinoa is closely related to species such as beets, spinach, and tumbleweeds. Its leaves are also eaten as a leaf vegetable, much like amaranth, but the commercial availability of quinoa greens is currently limited. Overview Derived from the Spanish spelling of the Quechua name, kinwa, Quinoa originated in the Andean region of South America, where it was domesticated 3000 to 4000 years ago for human consumption, though archeological evidence shows a non-domesticated association with pastoral herding some 5200 to 7000 years ago. Quinoa is generally undemanding and altitude-hardy, so it can be easily cultivated over 13,120 ft (4,000 m). Depending on the variety, quinoa's optimal growing conditions are in cool climates with temperatures that range from 25°F/-3°C, during the night, to below 95°F/35°C, during the day, with an annual precipitation of 10-15 inches (26–38 cm). Quinoa does best in sandy, well-drained soils with a low nutrient content and a soil condition of 4.8 pH (high acidity) to 8.0 pH (alkaline). Yields are maximized when 150 to 180 lbs N/acre are available. The Incas, who held the crop to be sacred, referred to quinoa as chisaya mama or 'mother of all grains', and it was the Inca emperor who would traditionally sow the first seeds of the season using 'golden implements'. During the European conquest of South America quinoa was scorned by the Spanish colonists as 'food for Indians', and even actively suppressed its cultivation, due to its status within indigenous non-Christian ceremonies. In fact, the conquistadors forbade quinoa cultivation for a time and the Incas were forced to grow wheat instead. Quinoa was of great nutritional importance in pre-Columbian Andean civilizations, being secondary only to the potato, and was followed in importance by maize. In contemporary times, this crop has become highly appreciated for its nutritional value, as its protein content is very high (12%–18%). Unlike wheat or rice (which are low in lysine), and like oats, quinoa contains a balanced set of essential amino acids for humans, making it an unusually complete protein source among plant foods. It is a good source of dietary fiber and phosphorus and is high in magnesium and iron. Quinoa is gluten-free and considered easy to digest. 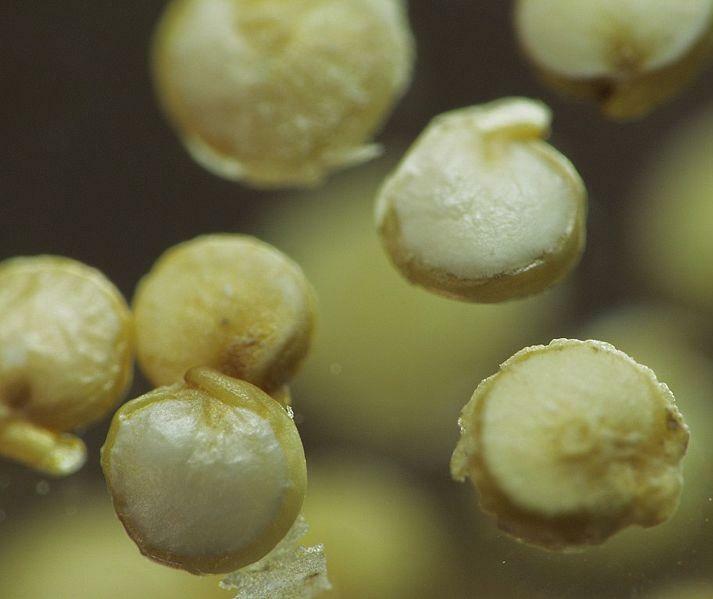 Because of all these characteristics, quinoa is being considered a possible crop in NASA's Controlled Ecological Life Support System for long-duration manned spaceflights. A spoonful of quinoa Quinoa has a light, fluffy texture when cooked, and its mild, slightly nutty flavor makes it an alternative to white rice or couscous. IT DOES NOT CONTENT CHOLESTEROL,IT DOES NOW ALLOW TO KEEP FAT IN THE BODY, DUE TO THE PRESENCE OF NON-SATURATED OLIC ACIDS IS PRACTICALLY ZERO. IT MAKES DIGESTION EASIE.